Description: Whereas early toys such as the #983 Safety School Bus, the #234 Nifty Station Wagon and the #151 Goldilocks and The 3 Bears were Little People sets that masqueraded as pull toys, the Happy Hoppers was a pull toy that masqueraded as a Little People set. The Happy Hoppers is a similar concept to the old #808 and #809 Pop 'n Ring push toys, instead of balls, the Happy Hoppers contained 3 Original Little People figures who would pop inside a plastic dome as the toy was pushed. Ouch! Not only is this the last set to feature a straight-sided Lucky dog, it also used a few other very difficult to find exclusive people, tempting some collectors into opening the plastic dome to rescue these hard to find figures from their glass prison. Accessories: Please remember that the following accessories are the accessories that are pictured in the Fisher-Price catalogues. While the variations below are pictured in Fisher-Price catalogs and advertisements, they are only a few of the hundreds of possible figure combinations. During production, Fisher-Price used a random selection of figures in this toy. While these combinations may be unique, they do not make a particular Happy Hopper more or less valueable. FPT44344 - 18" Turquoise wooden push stick with a red plastic ball on one end. GTWW - Turquoise girl with red braids. DPWW - Red boy with a smiling face, red freckles, and a sideways yellow cap. HVWW - Black straight-sided dog wearing a yellow collar with dots. HRWW - Black straight-sided dog wearing a white collar with dots. GMWW - Deep Red girl with a blonde bob with bangs. EIWW - Turquoise boy with a red cowboy hat. GNWW or GNWP - Red girl with blonde braids. EFWW or EFWP - Turquoise boy with a smiling face, red freckles, "" eyebrows, and a red cap facing sideways. HUWW - Black straight-sided dog wearing a red collar with dots. GTWW or GTWP - Turquoise girl with red braids. DPWW or DPWP - Red boy with a smiling face, red freckles, and a sideways yellow cap. HWWW or HWWP - Black regular base dog wearing a red collar with lines. GNWP - Red girl with blonde braids. EFWP - Turquoise boy with a smiling face, red freckles, "" eyebrows, and a red cap facing sideways. KJWW - Black straight-sided dog wearing a red collar with lines. GNWP or GNPP - Red girl with blonde braids. EFWP or EFPP - Turquoise boy with a smiling face, red freckles, "" eyebrows, and a red cap facing sideways. HWWP or HWPP - Black regular base dog wearing a red collar with lines. DPWP or DPPP - Red boy with a smiling face, red freckles, and a sideways yellow cap. FPT1721 - Happy Hopper push toy with 3 figures. All figures have a Wood Body and a Wood Head. Lucky dog has a straight-sided body. FPT1722 - Happy Hopper push toy with 3 figures. All figures have either a Wood Body and a Wood Head or a Wood Body and a Plastic Head. Lucky dog has a regular-base body. WFL: 07-AG-15-5-A. Retail price in the 1971 J.C. Penneys Spring and Summer Catalogue was $2.77. 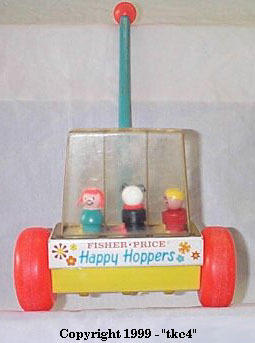 The Happy Hoppers were never sold in a box nor on a display card... they were sold individually in stores from a Happy Hoppers retail store display rack.